I've always heard the phrase, "the book is better than the movie." And in my limited experience, that has generally proven to be the case. But just because this is true, doesn't mean the movie isn't worth watching. And in the case of reluctant readers, watching movies may be the pathway to creating a love of reading. My son has always loved a good story. But he's always preferred to hear one rather than read it himself. When he was little, he would always bring a book and ask me to read to him. Even in our homeschool, our read-aloud sessions were - and still are - his favorites. But when it came to reading himself, he wasn't very keen. Until he discovered How to Train Your Dragon. And I don't mean the books. Oh, no. The movie and then the television series captured his imagination. Then one day, we happened to be on one of our weekly bookstore trips and he spotted a little book. It was a beginning reader featuring - yep! - How to Train Your Dragon. Normally, he would be pretty apathetic and impatient about our literary shopping trips. But not this time! So we bought it. And when he finished reading it, he begged me for another. And then, even though I thought they were far too advanced and difficult for him, I bought one of the bigger books by Cressida Cowell. I read the first chapter, and right when he was thoroughly hooked, I got "too busy" and told him to read it himself. He whined and begged, but I was very firm and told him I would read some more the next day if I had time. Before I knew it, he was reading it himself...before bed, in the car, on the couch. I would help him with difficult words, but otherwise he read the whole thing himself. And then I bought him another. And another. Then one day, we stumbled upon Jeffrey Brown's Jedi Academy. And my little Star Wars lover was gobbling down all of Brown's books on that subject. Now we all eagerly await young Roan's next adventure in the third book set to come out this June. From there we started ordering Indiana Jones books and graphic novels. And after that? We watched Lemony Snicket's Series of Unfortunate Events. I balked at the $13 price per book. Lucky for him, though, we found most of the series in hardback at a used bookstore for only $4 each. But don't get me wrong. My son, who is now a voracious reader at age 8, doesn't only read books about movie characters he loves. Remember how I said he has always loved a good story? Well, that passion for reading and stories has now grown to include new books and even classics. My once reluctant reader now easily accepts reading assignments in school, although I've had to abandon many of the easier reads for his grade. We started a set of illustrated classics I found at our local bookstore and he read aloud Robin Hood, Robinson Crusoe, and 20,000 Leagues Under the Sea. But he couldn't wait and wound up reading Treasure Island and The Adventures of Tom Sawyer without me. For school assignments, I've actively searched for "living books" written by authors passionate about the subject matter. We've even joined a homeschool book club. Now we keep a basket in our car on the floor between my children's seats that holds an assortment of reading materials. Everything from comics to mysteries to classics to activity books to magazines. They read everything they can get their hands on. While my daughter has always been a strong reader, I didn't think my son ever would be. I'm so grateful for that day I let him choose his own book. Even if it would be considered "twaddle" by some homeschoolers. Because I think to develop a love of reading in our kids, they need to be allowed to choose their own titles every now and then. Even when that interest is created by movies. 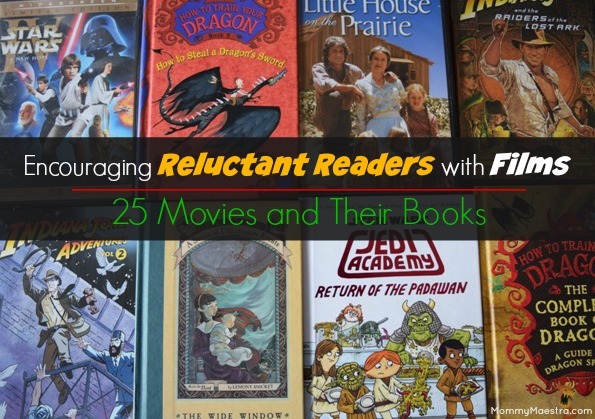 If you have a reluctant reader in your home, consider showing a movie first and then sharing the original or companion book. To help you, here's a short list to get you started. Keep in mind that there may be lots of other books or versions available than the ones I've listed here. For example, there are tons of books on Star Wars. But I listed Jedi Academy because it is perfect for a young child and ermerging reader. Great site...so happy to have found it! We're happy you found us, too!